Security is a very important requirement for Mobile users as they are easily liable of theft. Also there is always a constant risk of loss of both personal and critical business data stored in their smart phones. Bitdefender Mobile Security offers invincible protection for your smart phones against data theft, malware, spyware and viruses by using smart anti-theft technology and cloud-based malware detection. Also the software is very lightweight and robust, so it saves your battery life as well. 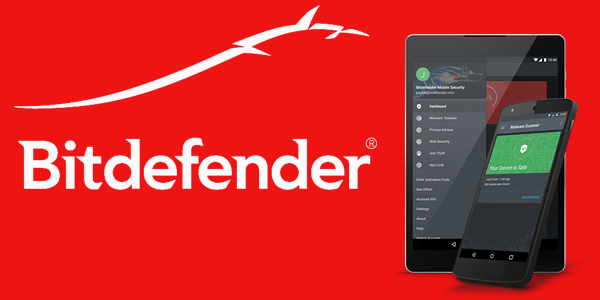 Bitdefender Antivirus is considered as the best antivirus makers for Android devices and the company has received the Editor’s choice award from PC magazine consecutively for 2 years in a row. Also it has got excellent scores from the AV Test conducted during July 2015. When compared to other Mobile security Apps like McAfee, AVG and Avast, Bitdefender Mobile Security had the highest rating of 6 in AV Test for offering the best protection to your Android smart phones. Bitdefender Mobile Security also has the most advanced cyber-security network which ensures ultra-fast scanning for known signatures and also lightning speed response in case of any threats. It keeps informing you about the safety of apps installed in your phone and what they are doing in background with the personal information stored in your device. Also it ensures all the online transactions you do from your Android phone is secure and protected from data theft by potential hackers. The software is very simple to use and runs in Autopilot mode, taking care of your mobile security completely. Once you activate the Autopilot mode in Bitdefender Mobile Security, it will automatically run all the cybersecurity processes in your Android phone so that you can be free of any worries related to data theft or malware attacks. The software provides warning to users when surfing through malicious web pages which contain spyware, malware or other harmful content and blocks such websites from accessing critical data stored in your phone. If you are surfing the web using public Wi-Fi on your smart phone and are concerned about sensitive data, you can lock those apps with the help of a pin code. Also when you connect through a trusted private Wi-Fi network which is secure, Bitdefender will automatically unlock those apps. It has in-built smartness to differentiate between trusted and untrusted networks. Privacy Advisor helps you to know how the applications installed in your Android phone are using your personal information and provides advice as to whether the app is safe or not. It will offer you privacy advice and keep you informed about the safety of apps installed on your phone. It is a very interesting and useful feature which allows users to remotely locate your Android device, swipe, lock or send messages from anywhere without the need of having physical contact with your phone. It also has a new feature which takes a mugshot of any unauthorized user who tries to misuse your phone. This helps you to recover your Android phone easily in case of any theft or loss. You can run a complete scan of all the apps installed on your device and ensure they are safe by running on-demand scan anytime. Also you can setup on-install scan which will automatically scan apps which you newly install on your phone and alerts you in case of any security threats. Bitdefender Mobile security uses cloud-based scanning and threat detection which ensures very high performance and does not cause any drop in your battery life. phone are using your personal information and provides advice as to whether the app is safe or not. It will offer you privacy advice and keep you informed about the safety of apps installed on your phone. This is another interesting feature which allows users to extend the security features of Bitdefender Mobile Security to accessories such as smart watch. It alerts you through notifications in case of device theft.